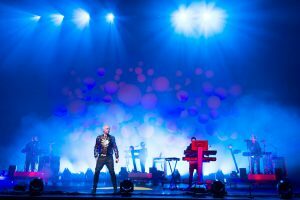 The Pet Shop Boys’ 20-year career has been full of moments that only they could get away with. They’ve managed to do the most highbrow things while retaining full membership of the pop mainstream, gaining the respect of cultural snobs without losing their knack for making proper pop hits. They’re a walking advert for the highest common denominator. Only the Pet Shop Boys could do the impossible and help Liza Minnelli to make a dignified comeback, as they did in 1989. Only they could enlist the help of Derek Jarman, the English National Opera and Sam Taylor-Wood to stage successive tours of the world’s giant performance sheds without alienating one half of their audience and being ridiculed by the other. Only they could do these things and keep having hits – 35 to date. So it seems perfectly normal, in the culture-straddling world of the Pet Shop Boys, that their latest venture is writing and performing a new soundtrack to that silent-movie buff’s favourite, Sergei Eisenstein’s Battleship Potemkin, at a free concert in Trafalgar Square. Even more rarefied, it’s a collaboration between the duo and the Dresdner Symphoniker, a group of musicians who perform only contemporary music and who hit the charts in Germany last year with a classical take on a song by Teutonic rock gods Rammstein. ‘One thing we’ve always tried to do is to make things into an event,’ says Pet Shop Boy Neil Tennant, sitting at a rickety picnic table outside a recording studio in one of Berlin’s near-bucolic outer suburbs, where the duo are overseeing the production of the Dresdner Symphoniker’s string parts with composer Torsten Rasch. Made in 1925, Eisenstein’s dramatisation of the brutal suppression of the 1905 revolution in Russia is not the most obvious choice for an evening of free entertainment subsidised by the Greater London Assembly. In fact, both the film and its new composers were chosen by departing ICA director Philip Dodd, who was given the run of the square for the evening by London’s mayor Ken Livingstone. Chris Lowe, historically the Pet Shop Boys’ Quiet One, stays true to his role as Tennant’s silently smirking foil, only entering the conversation in order to bring it crashing down to earth. ‘I think it must be,’ nods Tennant, knowledgeably. He’s as urbane as his references to the cities he has come to know in his life as ‘a player in the continental game’, to quote their Top 40 jet-set satire Single-Bilingual. Indeed, London has always seemed like the third member of the Pet Shop Boys. From the dispassionate lyrics of their first number one West End Girls, with its talk of underground dive bars and East End boys, to the twinkly, London-Eye-enhanced night skyline that graces the cover of their remix album Disco 3, it’s hard to imagine how the duo’s illustrious pop career and image of effortless cosmopolitanism could have had quite the same impact without the capital’s regular starring role in their songs. Trafalgar Square even inspired one of the three songs that feature in their 75-minute Potemkin soundtrack, which is likely to be released on CD later this year. Only the Pet Shop Boys could get away with being such quiet revolutionaries.